Samsara Seeds - Thunder Bloody Mary Auto. Free US delivery. 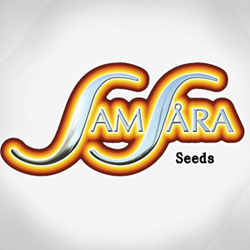 Samsara Seeds Thunder Bloody Mary Automatic has the best properties of an excellent Mazar mother that are cultivated in this variety with autoflowering pattern. This plant has even shorter growth period thanks to its rebred between Mazar and White Dwarf. Thunder Bloody Mary is an example how surprising nature can be. It's seeds can grow and bloom very fast within approximately 12 days giving us it's best results within only 62 days since the germination, keeping typical Afghan flavour. Indoor growth with 20/4 fotoperiod and proper plant pot size could give us over 45 gr. yield, reaching almost 75 gr. outdoor.